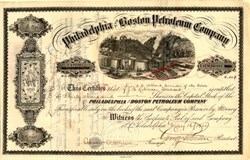 Beautiful certificate from the Philadelphia and Boston Petroleum Company issued no later than 1915. 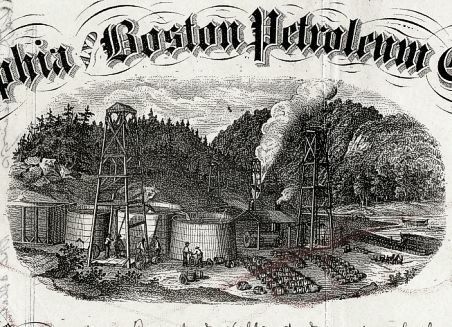 This historic document has an ornate border around it with a vignette of oil wells. This item is hand signed by the Company’s President and Treasurer and is over 93 years old. Condition is Extra Fine. The company produced oil from 1865 through 1929. Certificate Vignette The history of Venango County is inextricably connected with oil, for it was here that the oil industry began.The oil industry traces its roots to Titusville, just across the border in Crawford County, for it is there that Col. Edwin L. Drake drilled the first oil well, thereby setting into motion a chain of events that resulted in the creation of one of the mightiest industries the world has ever known.